Archaeologist Glenn Schwartz has embarked on an expedition to north-western Syria to study the mysteries of ancient Tuba, a 4,000-year-old city that suddenly collapsed and later resurrected itself. It's a scenario that has been played out in various regions of the world over the millennia. Cities and whole civilisations disappear, some for no obvious reasons. "The question is, why are these early civilisations so brittle?" said Dr Schwartz, an assistant professor of Near Eastern studies at the Johns Hopkins University. "One reason that's been suggested lately is the climate change. "It's been suggested that these early urban civilisations were so fragile because they placed extensive demands on their environments, continually intensifying their agriculture to feed more people. The added stress from a few dry years may have been the straw that broke the camel's back." That's just one theory Schwartz plans to investigate during the first of what will likely be several seasons of research at Umm el-Marra, the probable site of an ancient city called Tuba, located to the east of the modern city of Aleppo. Umm el- Marra was a medium-size city, and archaeological evidence indicates it was the largest metropolis in the Jabbul Plain, an intersection of ancient trade routes. Located to the south-west was the ancient city of Ebla, where Italian excavators in the 1970s stunned the archaeological world by discovering a sophisticated urban civilisation, dating back to about 2400 BC, complete with 17,000 tablets inscribed with ancient writings. That discovery revealed that Mesopotamia and Egypt were not the only early centres of advanced urban civilisation in the Near East. "It completely changed our ideas of what was going on in Syria in this period," Schwartz said. "It was always assumed that Syria was not even literate in this period." 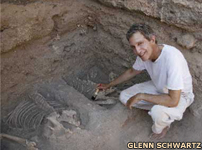 Glenn Schwartz, who is collaborating with archaeologist Hans Curvers from the University of Amsterdam, left for Syria on 1 May and will return in mid-July. They have worked together on previous research into the important roles played by rural towns in ancient civilisation, particularly at the site of Tell al- Raqa'i, along the valley of the River Khabur in north-eastern Syria. The research at Umm el-Marra is different, since it deals with what apparently was a political and economic centre, not a rural community. The team's work won't be limited to uncovering the complexities of Tuba. "We intend to do a regional study," Schwartz said, noting that the archaeologists will conduct a survey of the entire Jabbul Plain. Hopkins graduate student Tawny Holm will participate in the work, along with students from other institutions. Researchers hope to learn details of demographic changes, the development of cities, relationships between communities and their physical environments and how those factors changed over time. One such environmental factor is climate, which might have presented a special social hardship in ancient Tuba. "There seems to have been a drying up in the third millennium," Schwartz said. An extended drought might have contributed to the city's collapse in about 2100 BC. But the fall of Tuba and its surrounding region is only half of the story. "I also want to go to the next step, which is how did they manage to resurrect themselves after the disaster?" said Schwartz. "You have a reappearance of large urban centres and healthy political states vying with one another shortly thereafter. "How do urban centres manage to re-invent themselves? How do they get up after they fall?" Tuba, which was occupied for at least 1,100 years beginning in 2500 BC, enjoyed a second period of prosperity and power after the collapse around 2100 BC, becoming a major centre once again. 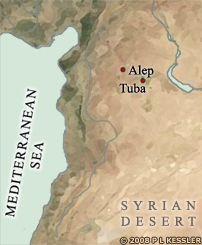 In this period, Tuba was a 'subsidiary capital' of the kingdom of Yamkhad, an extensive but little-known state about which Schwartz hopes to learn more, he said. Text copyright © John Hopkins University Press Department.